Home » Questioning Guide » Where does violence come from? Violence is so predominant in our society, and one must ask why? How does violence arise? Why does it seem impossible to stop? Let me first begin with the fact that fear creates violence. People use fear to control others, but what they do not realize is that that same fear in fact will create violence in order to defend itself from the boogie man. Now, is this true? Does fear create violence? One has to seek within ourselves, and ask: Is there a relationship between myself being anger and a state of fear? For example, if I lose a loved one. I get angry at life. Is this anger directly proportional to the loss of the loved one? Is this anger related to my state of fear because I feel vulnerable without my loved ones who gave me a sense of inner security? The chain that does not end, unless you end the conditional response. A response that has been nurtured by a cultural tradition of what kinds of responses are expected from you when being attacked. Ask yourself: When did you learn to act this way? Do you remember a specific moment? Most probably, you won’t. In fact, what you will remember is a set of rules set by example. Your family might be trapped within this cycle or perhaps, a lover or a dear friend. If you do, realize that this process is taking place in your life. The only way to cut the chain is to walk away from those who are not willing to modify their pattern of aggression. This might sound radical, but how can you change someone or something that is not willing to admit that something is wrong? You can’t. You can only choose to change yourself, and that can only be done if you are no longer in the cycle. There are certain people who might trigger these emotional processes easier than others within yourself. Therefore, do not expect to change instantly. It takes time to override each and every button you have that can be triggered by a removal of your beliefs of safety (i.e fear based manipulation). The reason people use fear to control is because it works in the short term. If you fear something, you will easily fall into manipulation of those who want to control you. For example, if you do not want to sleep. Perhaps, a family member threatened to call the police and take you away if you did not sleep when they told you so. That act is creating fear through psychological violence. In fact, fear is not good or bad. It is supposed to prevent you from harming yourself, but I ask: What would happen if our society stopped controlling through fear? What would happen if instead of fear, a new process called awareness of the consequences occurred? As in the example above, what would happen if instead of threatening with the police, one would explain once and again the reason one has to sleep early? Why is it not explained that it is needed to rest in order for others to rest and also to be strong every day after resting? It is not about not being able to understand! It is about being patient until one gets it! But, what happens if we are inside the cycle? Is there a way out? This is a suggestion, but do work out your own process. Without deep analysis there won’t be real progress. 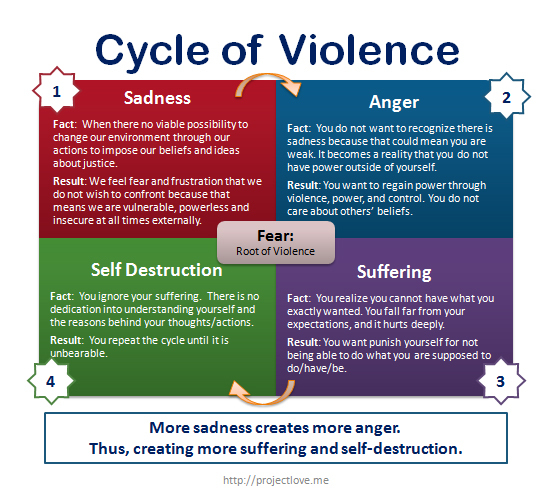 Repeat each time you are in the cycle of violence. Don’t expect to be violence free at your first attempt. It is a process. It will take many years to master a peace mindset. Be patient. Why do we prefer to threaten, instead of being patient? The reason is fear. The use of threats occurs because the one threatening is afraid of the response of the one being manipulated. However, if one does not fear but understands and becomes patient… Where will fear go? What happens with fear? Does it really matter if we cannot eradicate fear? What is the key aspect here? In order to overcome fear and violence, one must become aware. Fear is the one that will make you enter the cycle of violence. It is not until to realize this that you can actually change your violent mindset, thus by becoming aware you can change. Fear can be overcome if it is confronted. If it is ignored it could become harmful through this vicious cycle, until you decide enough is enough! However, if fear is ignored… There might be a very good reason. Do not be fooled or convinced by my ideas. I am just initiating the discussion. Challenge! Defeat my thought with real awareness of yourself. You need to get into it by yourself. It is all up to you to change! No one will do it for you. You are the only one who that can beat violence through an awareness of its process within yourself as you feel your body getting tense with adrenaline. Choose not to fall into the cycle. If you fail to be calm, do not fall into the trap of frustration as it is also part of fear. 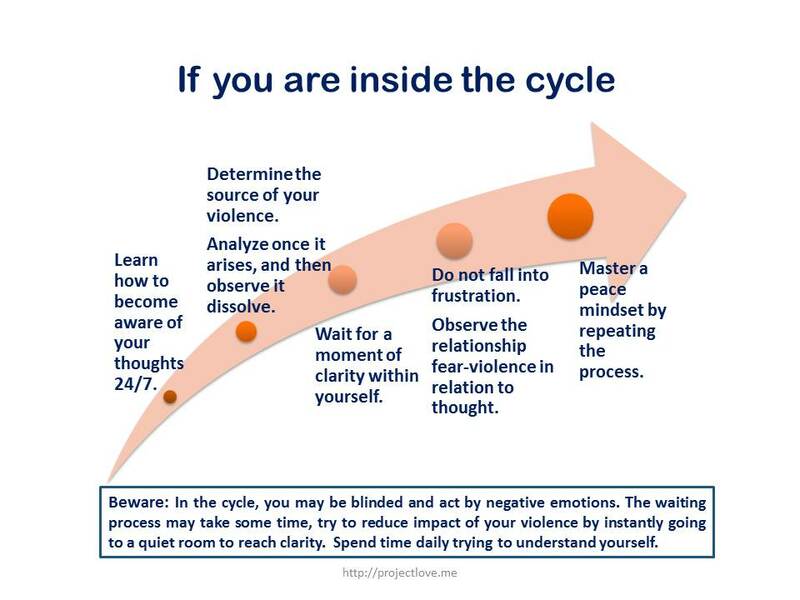 You might be afraid of not letting go of the cycle. Fear is elusive, yet it might be there when you think it is not. Be calm. Be patient. Observe yourself. Question these ideas, and create your own solutions. Observe your inner self mindfully to become aware! Only your own observations can answer this!